I look forward to participating in the CIO 100 Symposium this weekend, an annual gathering of hundreds of the world’s smartest IT leaders who share best practices and advice on how they continue to thrive in the face of a severely competitive marketplace. Innovation, the theme of this year’s conference, can be a challenge for many well-established enterprises. Innovation touches everything we do in our businesses, from products and customer experiences to HR and workforce management. A creative and inspired approach to business strategy can empower the kind of innovation that will set an enterprise apart from its competition. Dell Services’ latest research, Stop/Start/Do Differently: A new framework for evaluating success in a future-ready enterprise, included more than 400 executive, management and IT leaders in large, U.S. based organizations. We asked respondents to select which activities, attitudes, behaviors and ideas they would stop, start and do differently to succeed in five common, big-solution areas: modernization of applications, employee empowerment, customer centricity, growth imperatives and digital transformations. In this context and in the spirit of innovation, on Sunday, August 14, I along with some of my colleagues, will host a roundtable focused on the critical steps necessary to build a strategic framework that will meet the changing technology landscape that CIO and IT leaders face today. Joining me on the roundtable will be Tim McMullen, Executive Director Global Provider & Life Sciences New Sales, Business Development and Consulting; and Bob May, Executive Director Commercial Industries. The topic of discussion will be Converging Disruption: Creating a Framework for Digital Transformation, Big Data, and IoT. Kris Fitzgerald, Executive Director, Office of the CTO will lead the workshop component of the roundtable. Kris will focus on the areas participants would stop, start and do differently when optimizing a business model that encompasses enabling technologies. He will also address the changing nature of work and new organizational structures. Taking a deeper dive into digital transformation and as part of the technical sessions at CIO 100, Prasad Thrikutam, ‎President of Applications & Digital Business at Dell Services, will lead the Cognitive Enterprises and the Pre-requisites for Digital-Speed IT session on Monday, August 15. IT leaders know that businesses must be able to respond quickly to changing markets, business needs and competition. Joining Prasad will be Bob Lewis, Senior Principal Consultant with the Digital Business Consulting group and lead author of The Cognitive Enterprise. Attendees will learn the three prerequisites for achieving Digital-Speed IT: Measurement, Friction Analysis and Velocity Analysis. For additional background, I encourage you to read the Dell Services whitepaper Digital High-Speed IT. At Dell Services, we’re extremely proud of our diverse leadership, including many intelligent and driven women that guide the direction of our business. Investing in the professional development of women is a priority, from classroom to boardroom, through projects like Girl Scouts and Women in Technology associations and events. Dell Services’ participation in the CIO 100 is reflective of the importance the symposium places on women in leadership roles. Mona Charif, vice president of Marketing & Communications at Dell Services will co-present Sharpen Your Competencies: Future State of CIO Competencies with Pam Stenson, president of the CIO Executive Council. 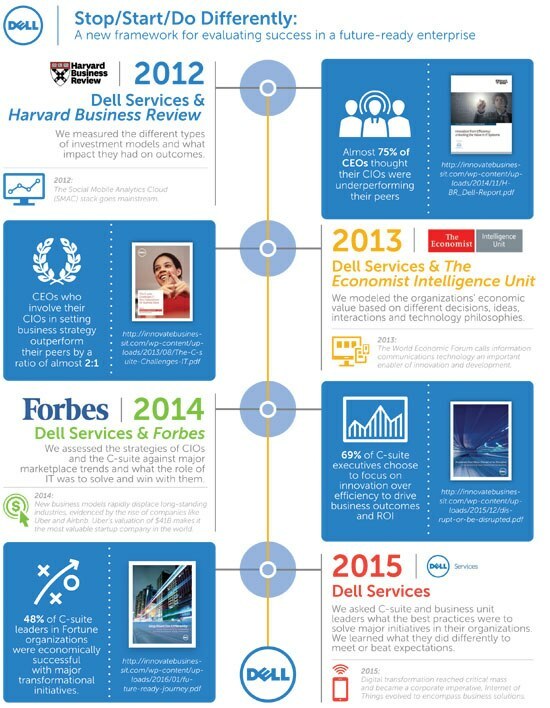 At Dell Services, we rely on innovation to help enable the success of our clients. We understand that disruptive trends, like digital transformation and IoT advances, are key to meeting our customers’ evolving expectations. We strive to ensure that we not only remain relevant in our customers’ eyes, but are seen as indispensable partners in helping them achieve their goals. We look forward to learning more about our customers’ perspectives and paths involving innovation in their industries, and sharing that knowledge as part of our continued research on the role of the CxO in the future-relevant enterprise.